When we talk about getting the best response rate from potential candidates or clients, one of the important considerations is how the message (text, email, etc.) looks on their end. A friendly way to reach someone, that LinkedIn has had as its Social Networking function for a long time, is to be introduced by a common connection. However, if you have been relying on LinkedIn Introductions – sorry to bring the bad news: they are broken (and have been broken at least for several months). There are several challenges, the worst being the way LinkedIn introductions arrive on the receiver’s end, that make the built-in introductions useless. Here are some details. unfortunately we will be simply taken to the Inbox, so that is a dead-end. At least it’s clear that doesn’t work! (It’s a bug). We no longer have a choice of the connection in common to introduce us (as it used to be before this User Interface redesign). These days, LinkedIn decides for us who that person should be. Still, even if I’d prefer to be introduced through another connection than the one offered, it seems to be an OK way to reach out. Here is the most broken part. Did you know that this is how the request arrives on the introducing person’s end? Which Michelle? – might ask Martin (I’ve looked at his and my connections in common, and there are four Michelles; I imagine, there are more Michelles that are his connections and not mine.) In case of an even more common name to be introduced to, this would be a mystery. Since this built-in “intro” functionality produces more confusion than help, you can take complete control over introductions, in the following way. First, find all the common connections with the person to be introduced to (search for the person and click on the green link with the “shared connections”). 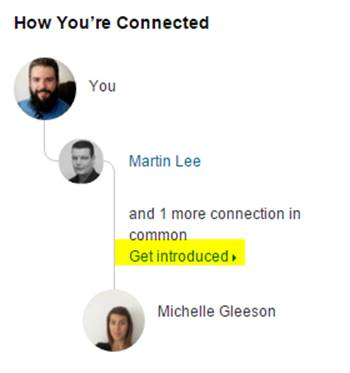 Second, select a connection in common for the introduction and hand-create a better intro message than LinkedIn does. This method requires a bunch of mouse-clicks and typing but at least it has a better chance to work. An alternative is to pay for InMails, as the help page suggests. To get a broad picture of ways to fix LinkedIn built-in functionality, sign up for our webinar Overcoming LinkedIn’s Limitations, which turned out to be very popular! Hi Irina- as always, very helpful post. Would this method work for Inmails, e.g. not so much for the name part, but say if you want to tailor your messaging a bit more, like inserting a company name that is linked to a Company profile on LI? “I know you’re probably not ready to jump ship from blah blah blah (Which is People Sourcing Certification company link). And also, could you also say : We have in common blah blah. Have you tested this? I can’t seem to find someone outside my network where this would work. “I know you’re probably not ready to jump ship from (this is where you would insert the company LinkedIn profile url) blah blah blah (Which is People Sourcing Certification company link). And also, could you also say : We have in common (the first and last name in your format) blah blah. Have you tested this? I can’t seem to find someone outside my network where this would work.